I’ve been to numerous afternoon teas over the years and have to say they really are a treat. The anticipation of seeing all the pretty, dainty, freshly cut sandwiches, scones and the beautiful pastries that differ at each location really does get me excited. 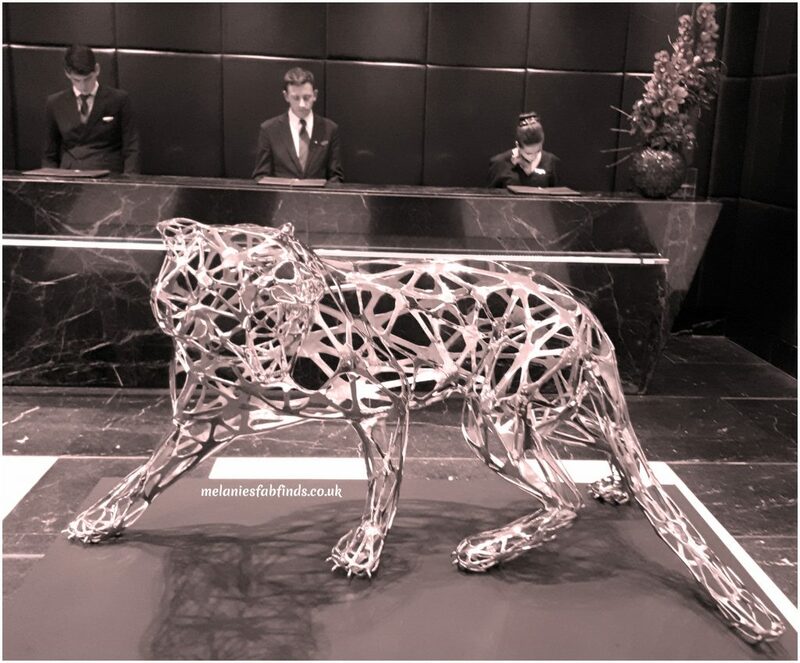 Recently I was invited to the Sofitel St James a beautiful 5 star hotel in the heart of London and situated close to St James park where you can stroll and enjoy the scenery or take in the local sites such as Trafalgar Square, The London Eye and more. The reception area is nicely laid out with pieces of art located around the room and comfortable sofas. Afternoon tea was served in the The Rose Lounge. You can also enjoy afternoon tea at The Balcon also situated within the hotel. 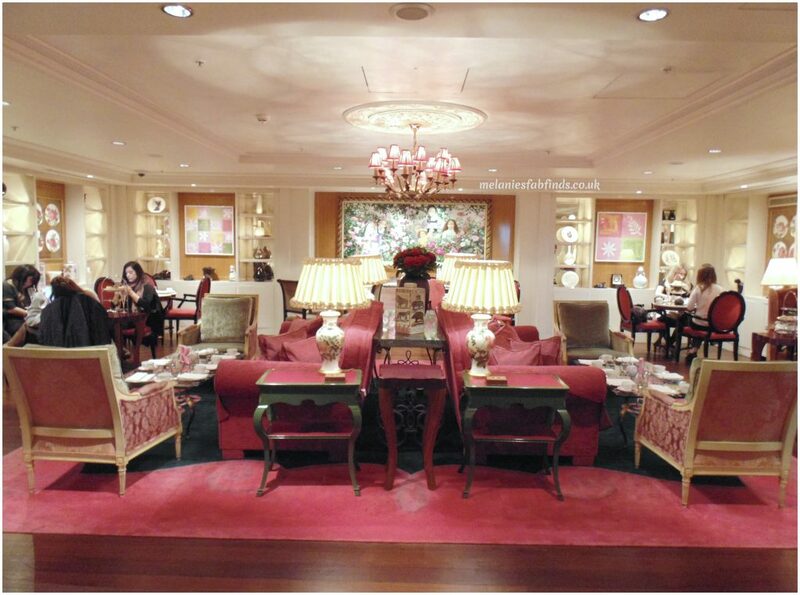 The Rose Lounge is pink in colour and has a French living room style appearance. It has a cosy feel and the seating is comfortable and I loved the fact that they had sofas. The tables vary in size depending on where you sit. Ours was a touch on the small side (only because I like room for my pictures) but we managed to fit in everything we needed. Taken from an Indian recipe, this creation is made of Indian spices with ginger, clove, pink peppercorn and cardamon. 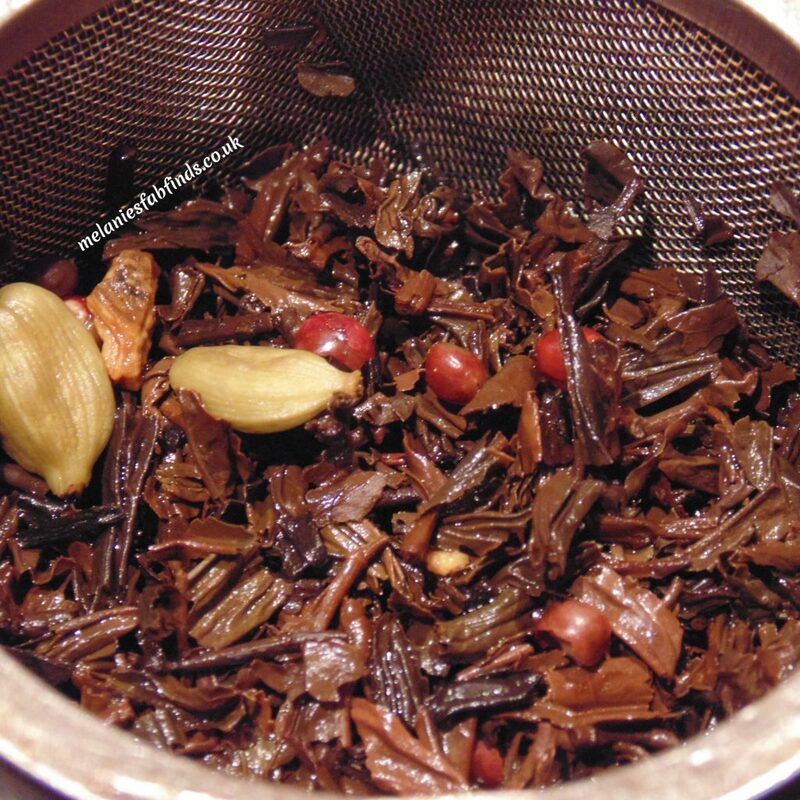 The smell of this tea alone was fantastic It had an earthy and warming, light flavour. You can see the spices in the strainer. It was really nice and one you should try. Delicate white Chinese tea combining subtle flavours of rose,apricot and passion fruit. A refreshing and flavoursome tea. It was a lovely fruity, sweet smelling and refreshing tea. You can even smell and taste the passion fruit and it isn’t at all overbearing. I loved this tea even more than the one my friend choose and even had the pot topped up with water at one stage. These were all served fresh. 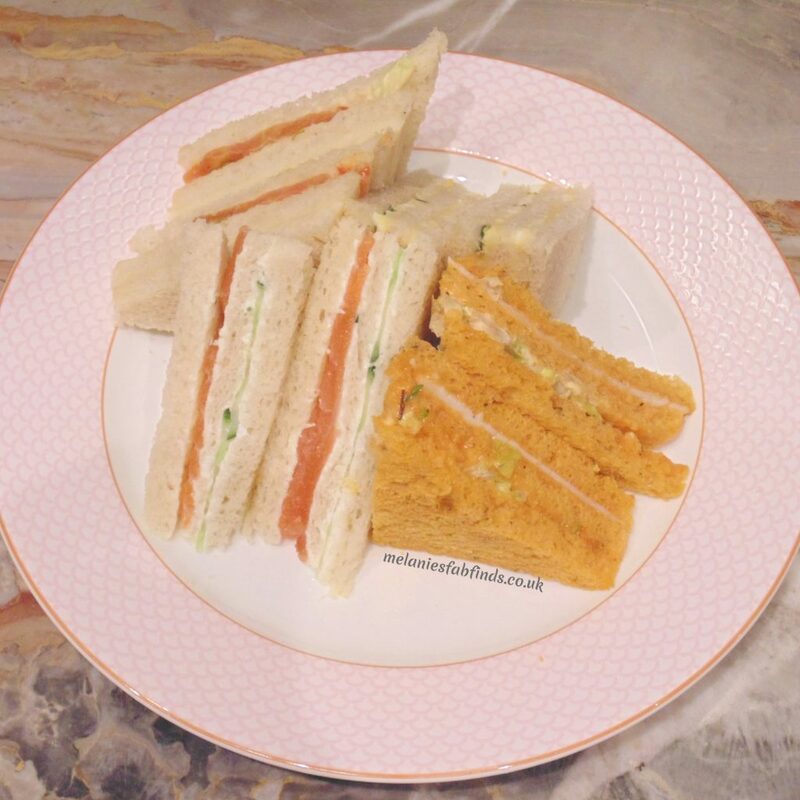 The sandwiches were all double layered – the different components being separated out making them look pretty. The hummus worked well in this sandwich to add some much needed flavour as the mozzarella is light and didn’t really come through much. A favourite amongst afternoon tea goers for very good reason. This is a great little sandwich and the layering makes it look even more enticing. The ingredients tasted fresh, light yet flavoursome. A great sandwich that is tasty and sophisticated. This had far more flavour than I had initially expected and is a prime example as to why one should never assume anything. I came with an open mind but could easily have assumed that it would be bland as turkey dishes often are (my turkey and chorizo empanadas are nice and tasty though) but I was pleasantly surprised. The mustard in these gave it a nice little burst of heat which was great. The tomato bread was not to strong in flavour and it was nice to have the different flavour contrast within the sandwich. The egg was not overpowering and there a good amount of mayonnaise making this seem quite delicate in flavour. Although I did like it I would probably suggest changing it for something a little more egg-citing (sorry couldn’t help myself). These came in three different flavours, plain, chocolate chip and raisin and were served with little bowls containing rose and strawberry jam, lemon curd and also clotted cream. The strawberry and rose jam was delicious and in the right proportions so the flavour of the rose did not dominate but instead complemented that of the strawberry. It was delicious! The lemon curd was just as gorgeous and extremely mouthwatering. The cream was lovely and thick and gave a gorgeous contrast to the jam and curd. The scones were all nice but my favourite had to be the plain ones. It was great to try the others, the chocolate chip scone had a generous amount of chocolate chips and the raisin scone had nice big plump raisins but the texture of both was not as good as that of the plain scones. The plain scones seemed more buttery and more moist. At most high end afternoon tea locations I have noted that the scones are brought to you after the sandwiches have been eaten and staff have checked you have had your fill of the dainty savoury bites. Here we were served the scones with the sandwiches which is something I feel is a oversight as they had cooled considerably by the time we had made it that far. Another thing I noticed was that it was not until we had started eating the scones that we were asked if we wanted any more of the sandwiches. Normally one would be asked after eating the sandwiches whether they would like any more and then once any additional sandwiches had been eaten the freshly made scones would be served. As this is a 5* establishment I would have expected that little detail to have been addressed already but then I also hear there are changes in place so I look forward to discovering what they will be at a later date. The best part of any afternoon tea for me having a major sweet tooth. 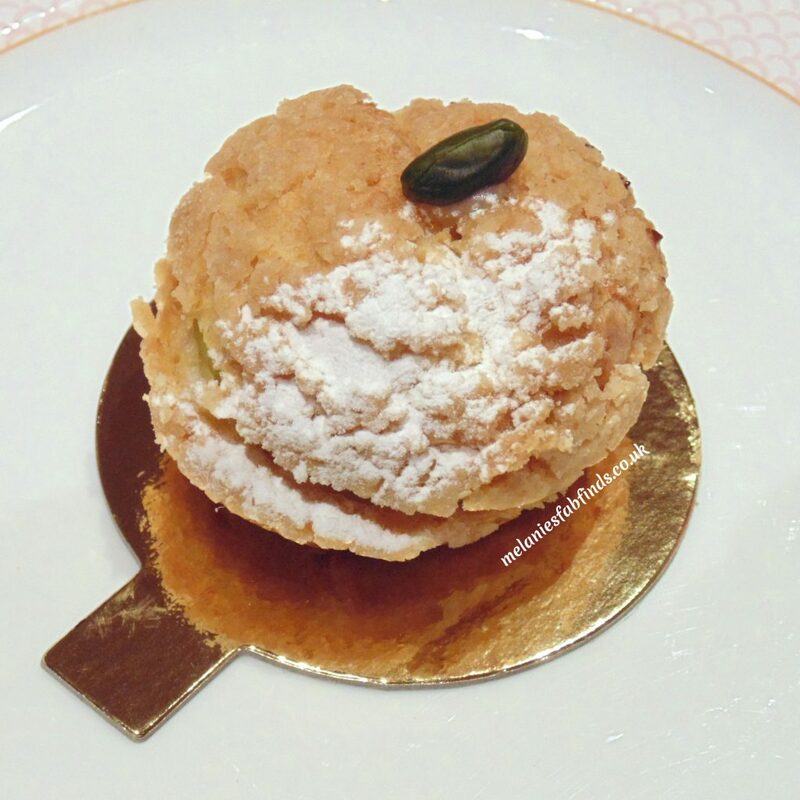 The Parisienne style pastries looked beautiful and during week days you can choose which you would like off the trolley. Over the weekend they tend to chose for you and bring a selection to the table. Each guest will be given two of these pretty pastries to indulge in. In addition guests will also be given a slice of the cake of the day from the trolley. As the pastries were already at our table and proving irresistible we asked to have an extra of those instead of the slice of the other cake. The pastries here really did look amazing and clearly a lot of thought has gone into the creation and presentation of each. Some afternoon teas pastries I have seen advertised look quite boring in comparison. But do they taste as good as they look? You’ll have to read on to find out! You have to agree they all look stunning, like little works of art which they really are. The tart tasted as good as it looked. The pastry was cooked perfectly with a good crumbly texture and sweetness, the cream was light and fluffy and the fruit was firm and fresh. A good one to start with. One that my friend had chosen and I must say I was glad that she did. 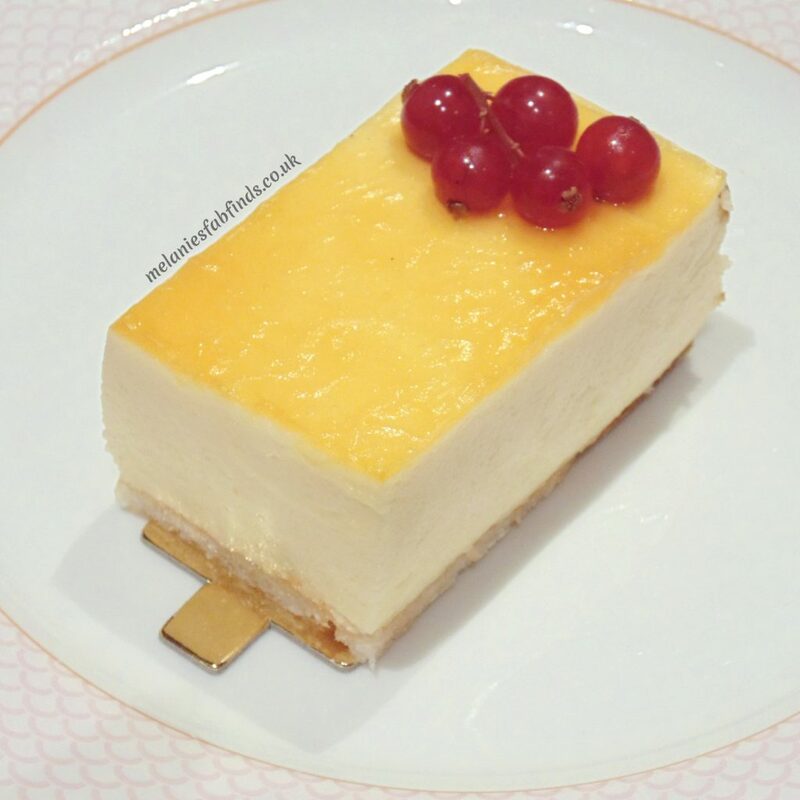 The moment I attacked it with my fork and tasted the tangy passion fruit top followed by the smooth creamy vanilla cream centre and finished with a coconut sponge base I was in heaven with it’s tropical flavours. It was divine and really did highlight how good a well made cheesecake can taste. Another stunningly delicious offering. The pastry chef is obviously worth their weight in gold. The combination of the pistachio cream and cherry went superbly well within the heart of the sweet crumbly pastry shell. 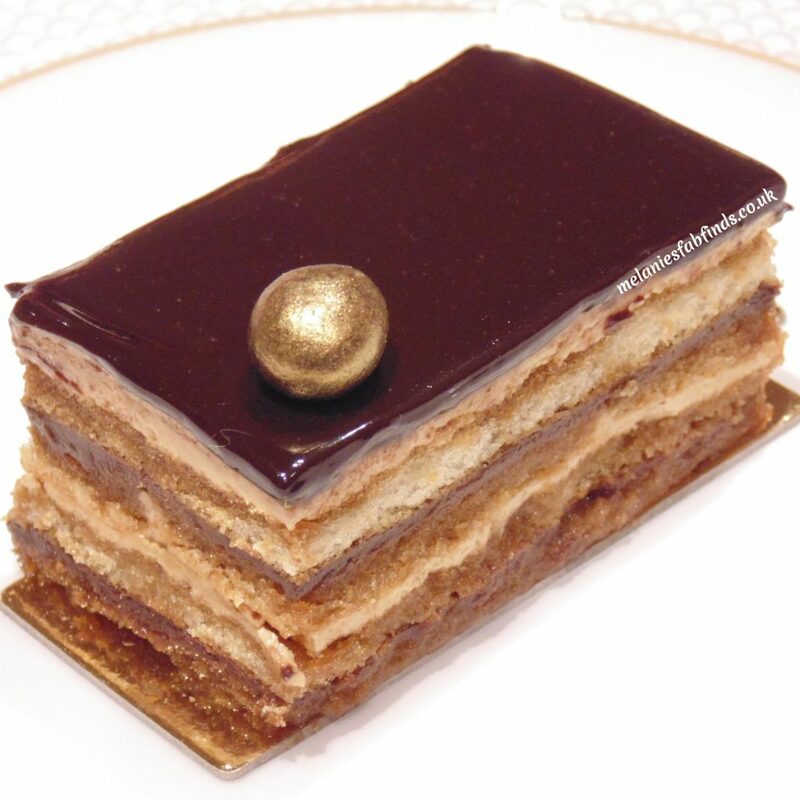 Layers of gorgeous coffee soaked sponge topped with delicious coffee cream and chocolate make this a fabulous choice. It was really lovely and the gold covered coffee bean finishes this nicely. This is topped with freeze dried raspberries for an added tang. 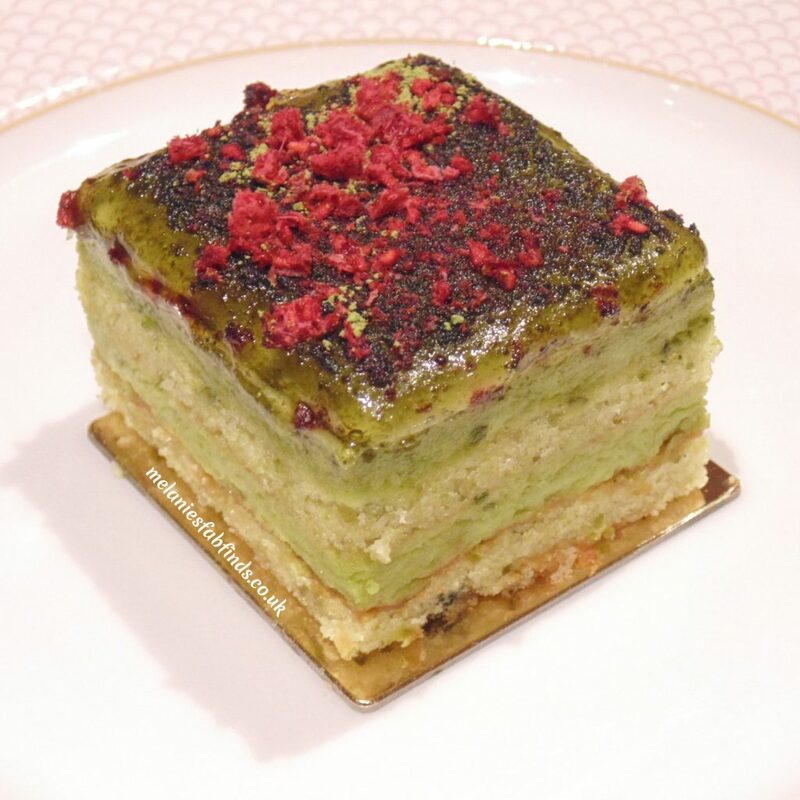 Hidden within the layers of soft moist sponge and sweet cream were small pieces of pistachio. This again was wonderful and I have to say I thought all the desserts were exceptional. This was like a Ferrero Rocher in cake version. 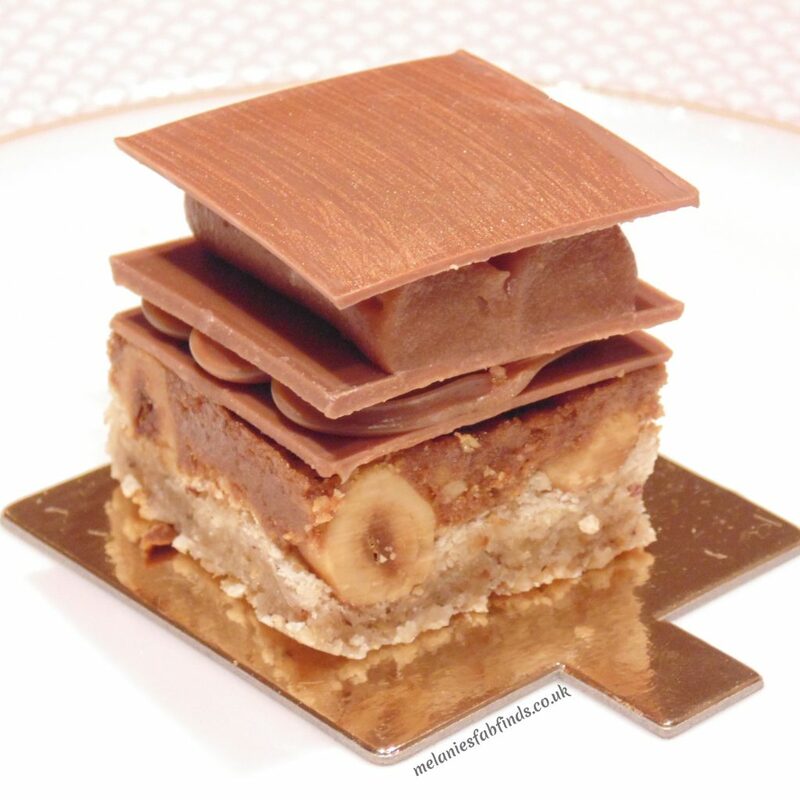 The base was crispy and crunchy with nice sized chunks of hazelnut. There was what tasted like a chocolate icing which was quite sugary – this was the only dessert I would consider adapting. In essence it is good, the only thing that let it down was the chocolate icing. We halved all of the six pastries and I have to say it was a good thing as they were all delicious and it was great to try them all even though we did struggle. You will be pleased to know we went for a brisk power walk after! I found that the service here was a little up and down. Although staff were friendly enough there were no staff members based in the room, they seemed to flit in and out serving customers meaning that if you did need someone you would need to try to catch their attention when they returned. In comparison, at some other locations the staff seemed to be more easily accessible and would appear from nowhere to refill water glasses or tea cups before you had even noticed they had gone down which didn’t seem to happen here. These extra touches can make an afternoon tea stand out from a good to an amazing experience. The presentation of dishes here as you can see was good and everything looked extremely appealing. The harpist was a great little extra and played beautifully. You can’t help but feel relaxed and enjoy the music which was varied and we heard a few songs we recognised including Beauty and the Beast. 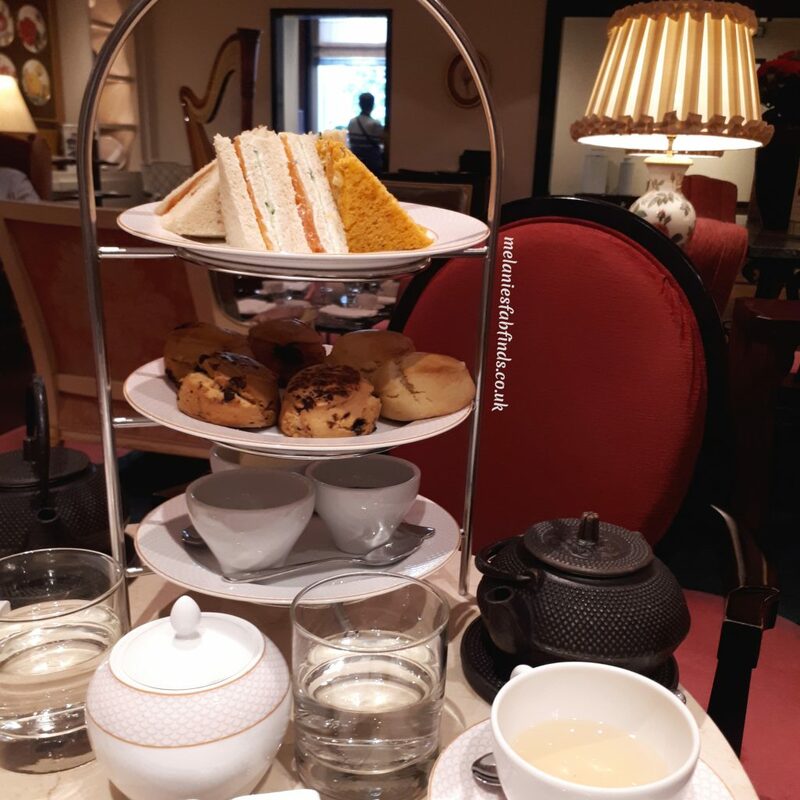 Although I did find a few little bits here and there it didn’t take from the fact that I did enjoy my Afternoon Tea at the Rose Lounge and I would definitely consider returning with my friends as they too can appreciate a good afternoon tea. 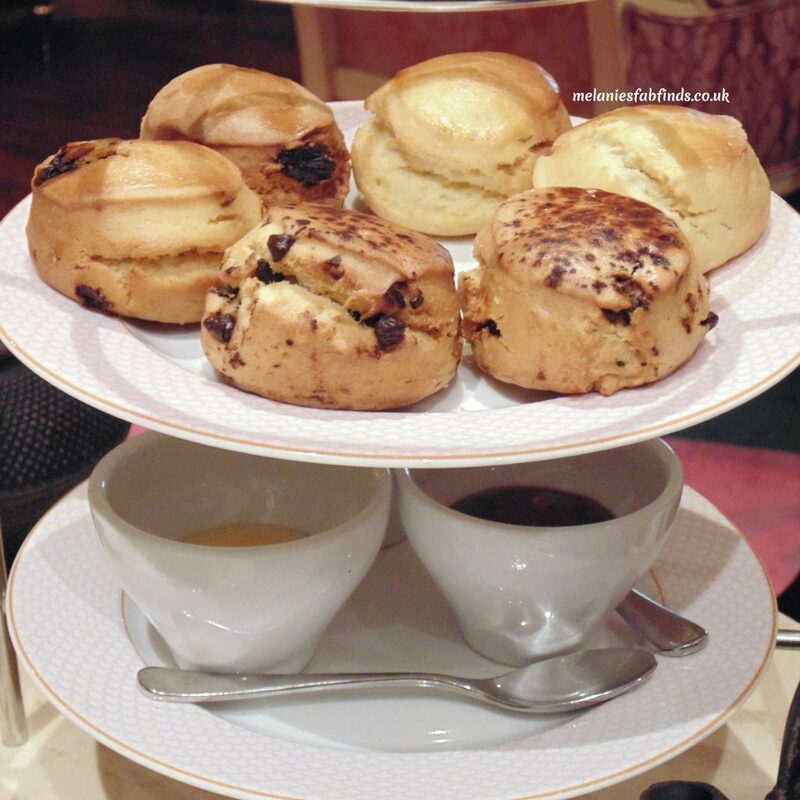 Have you experienced an Afternoon Tea yet? 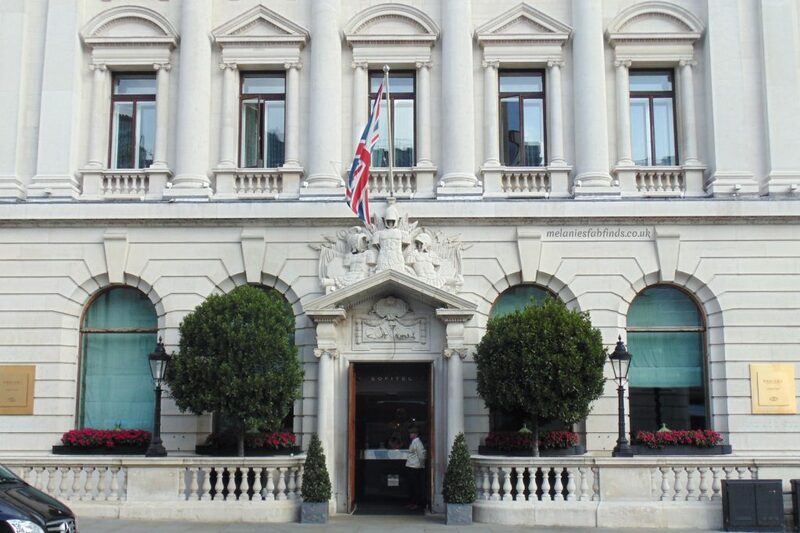 Disclaimer: I was invited to the Sofitel Hotel St James to try an Afternoon Tea and give an honest opinion. I thought the desserts really did stand out here, they were really exceptional. Those pastries look and sound amazing. I’ve had Afternoon Tea a few times and always had staff on hand in the room to cater for needs. It’s a shame a 5* establishment didn’t do that for you but hopefully it’s one thing they plan to address as you’ve mentioned. The pastries were really good. They did a wonderful job with those. I am sure they will be. I wonder if they will do a Christmassy themed afternoon tea!!! Ooh! I’ve been there for an event and had an afternoon tea which was lovely. I’d love to go though and just order the tea of choice – such a lovely luxury! It was really lovely there the hotel looks amazing. It was a nice mix of sandwiches, scones and cakes and one that must be tried. I love afternoon tea and this one looks amazing. The cakes are so elegant and the scones look delicious and I love the infused tea. I’m glad you had a lovely time. It was really nice and the food there was good. Oh my goodness the selection looks divine and what a perfect treat for a mama (or anyone really)! I was really impressed by the cakes and the harpist really was a lovely touch. Hi haven’t heard of this hotel before reading your post looks good in the photos and the location is great. I’ve been to several afternoon teas the last couple were at the Ritz and at Fortnum and Masons, really enjoyed both and would recommend. I’ve done the Ritz they were good but the cakes at the Sofitel St James were amazing! Afternoon tea is my favourite thing to have. This looks amazing and those cakes look the best I’ve seen! Oh I love afternoon tea, this looks so good! I’ll bear it in mind if we ever head that way! I tend to eat light meals the next day. It’s worth it, afternoon teas are lovely. Wow, what an elegant tea time setting. I have never experienced this and of course who would not want to experience it. I hope someone will invite me for some tea with this kind of setup too. So classy! It’s such a lovely place to visit. You must go visit sometime if you can you will love it. I’m getting hungry just by looking at those pictures. Looks like you had a great afternoon tea. Everything was just mouth watering. It really was yummy. You have to go try it! Me too they are yummy and it’s exciting to see the different selections. They looked and tasted great which was good. I hate it when you get cake at some laces and it looks so much nicer than it tastes. It was but they were still nice. I do love scones. Yum everything looks so delicious! Now there’s a place I would love to go to! It was yummy. I hope you get to go and try it too. I’ve never thought about putting chocolate drops in scones before! This afternoon tea looks amazing. I love the choice of desserts. They all look delicious. It must have been hard to choose which to have! I love afternoon tea and this looks amazing. The hardest part is choosing when they all look so good! This sounds absolutely incredible! I am dying to visit the UK to experience afternoon tea. It sounds just divine! WIll definitely be visiting the Rose Lounge when I go! Oh wow! That’s a beautiful lounge and the high tea time is so snobbish! I wanna try it some time, too. 😀 Quite exciting to dress up and have tea. I am Asian, so we don’t really have tea time. The reception area and afternoon tea look very good. Sounds like an amazing place. It is really lovely there. I quite fancy going again soon. Wow this looks super posh! 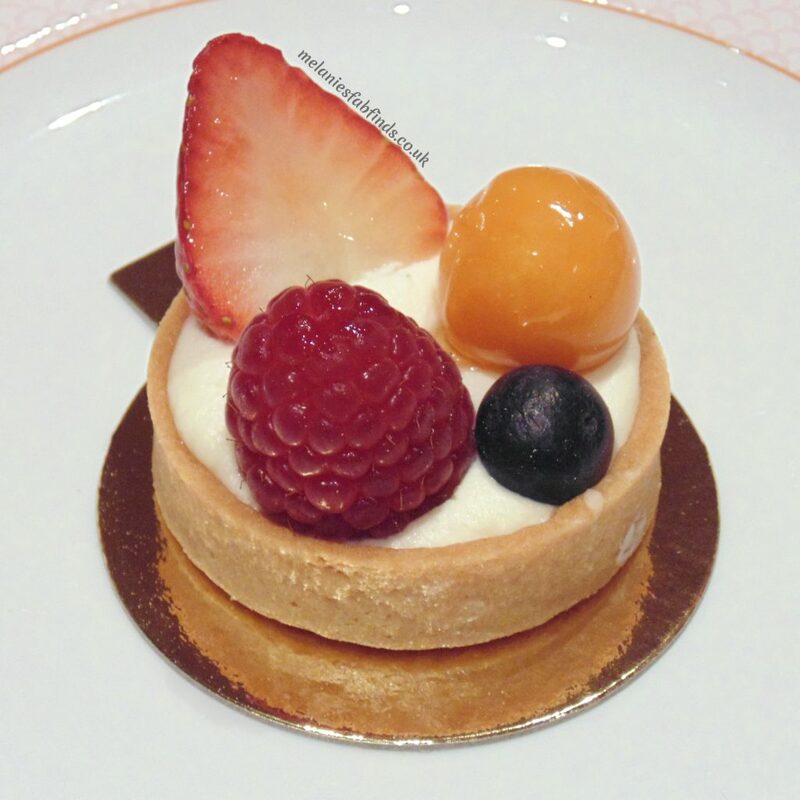 I love the elegance of the hotel and those desserts look AMAZING! So envious! This was a great afternoon tea. I thought the pastries were especially good. Started to feel hungry after seeing this post! What an amazing and elaborate menu for the afternoon tea at Rose Lounge. Especially the desserts look awesome. Last we had high tea in KL Tower, Malaysia and this one reminded us of that experience. I bet that was lovely. This one is really nice too! Afternoon tea is such a lovely way to pamper oneself. It looks absolutely delicious and I really hope you enjoyed everything it had to offer. I definitely have a craving for tea myself now. It is a lovely treat and one we should all so more often in my opinion. Yeah, you definitely don’t want more sandwiches after you have started your scones, geez. I miss fresh scones. Maybe I’ll whip up a batch, though they’re not the same as they are in the U.K.
I’ve always loved London and one of the things that I enjoy there is afternoon tea! Afternoon tea in the Rose Lounge of Sofitel sounds amazing! The food is every bit of lovely and so is the place! It’s definitely going to make you enjoy tea time more!